Jared Parks with juvenile great horned owl. Recent snow and frigid temperatures are difficult for humans, but even harder on birds. Birds have always been able to survive the cold and snow, said Jared Parks, land protection specialist for Eastern Shore Land Conservancy and local birder, although a fair amount of natural mortality from the cold is expected. 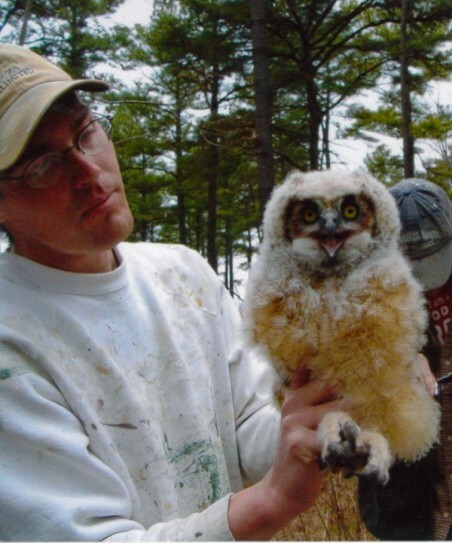 Parks has been birding all his life and before his tenure at ESLC was field crew leader on many bird study projects across the United States. 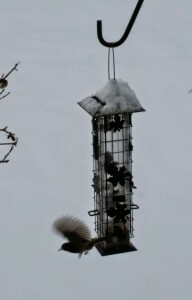 In harsh weather, birds have difficulty finding open ground on which to feed, he said. “Feeding birds is not necessary, but it is not a bad thing– and they will be very happy if you provide them a consistent food source – consistency being key,” Parks said. If you feed birds, keep feeding them. Feeders do not need constant refilling, but those who feed birds should provide food every day, preferably on a consistent schedule. Fresh water is important now too. Birds need to drink and bathe, and cold temperatures limit the availability of open fresh water. Water is tough for people to provide in extreme cold because it is hard to keep from freezing. “Frozen water can crack your bird bath,” Parks said. Small heaters and pumps both have limitations as pumps can freeze in extreme conditions, and water must not be too hot. Many wild bird feeding stores will have heaters and pumps that are appropriate for bird baths and should offer temperature limitations. To provide open ground for birds, shovel driveways and walks a bit wider than the pavement to uncover a few feet on either side. If most of the snow is removed, the sun will warm the darker ground, opening up spots where birds can get bits of food and gravel (which birds need to help crush their food). It creates the same effect that attracts birds to the edges of roads during times of snow cover. Plows often hit road edges, opening up some bare ground. The birds can’t find open ground anywhere else, so they flock to these areas for food, gravel, and even some salt. Providing spaces like this in your yard can be an important way for birds to find more food. “Shovel the areas, spread some food and the birds will be very happy with you,” Parks said. Consistently and thoroughly clean feeders with water, soap, bleach and a bottle brush. The bleach or similar disinfectant is important, but must be thoroughly rinsed so no traces are left behind. Wild bird feeding stores will also carry some bird-safe products to wash and disinfect feeders — probably the safest route to take for cleaning. Make sure the food is supplied consistently. Make sure the feeders are cleaned routinely. Offer water if you can manage it but be mindful of keeping the bath clean and the water from freezing in a safe non-toxic manner. Shovel some areas of ground along your drive, walks and some random places around your yard, if you want, to provide open ground for birds to feed. Parks will offer an introductory birding class Feb. 28 and a birding walk March 7 (raindate March 14) for those who took the class. Both will be held from 9 a.m. to noon, at the Wye Research and Education Center property, 124 Wye Narrows Drive, Queenstown. The class will cover bird watching basics, equipment, bird books, birding hotspots, backyard vs. field, birding groups online and in person, bird groups and how to tell them apart, describing birds for identification, habitat (and providing on your own property), and taking notes and journaling. Cost to supporters $25; New friends $35. Register online or email cstarr@eslc.org.